Warning: Soy Candles, you’re losing money by not using them. Soy candles what is there about them that can save you a bundle of money and exasperation. Have you ever had this experience: after a hard day at work coming home and as soon as you get there you head for your candle supply. Just thinking of relaxing and lighting a candle propping up your feet grabbing a cold glass of ice tea then leaning back and letting the tea and candles aroma just kind of making your frustrations disappear and melt away. As you reach your candle supply shelf you notice that the candles all look like they have burned down through the center and left a lot of wax clinging to the glass. Something else that is missing is the fragrance. After there have burned for a while regular candles seem to lose their punch when it comes to the aroma that they will produce as they burn. So another candle hit the trash can as you turn in exasperation set the ice tea back in the refrigerator and head for your computer to check your email. Here is where soy candles can save you a lot of money. Not only are you getting a cleaner burning candle (you don’t get the soot and black stains on your wall.) You also get a candle that burns clean right in the jar. As a soy candle burns you will not find the wax clinging to the jar like in regular candles. Also the aroma last right to the bottom of the jar. That is why a soy company like Papa’s Candle Shoppe can give a Guaranteed to burn clean.... right down to the bottom of the jar while keeping their robust aroma or we'll replace them free. So remember even if the price is a little higher (and most of the time it isn’t) Buy soy candles. And like we always say If the label says Papa’s Candle Shoppe the it is excellence in Soy. 5 Items on my, I don't want to do list. Even Soy Candle Makers Have There Day. Have you ever woken up and just felt well I guess you could say lazy. Today is Friday the 26th and 5 months from now we will be going full speed ahead replenishing our Soy Candles stock and shipping out many packages of candles you know the ones that don't cost our customers any shipping cost because of our free shipping policy. But right at the moment I can list at least 5 things I would like to skip doing today. Even though I do enjoy making highly scented soy candles and selling them to customers all over the world at time I feel like I would like to take a few days off. Since it is summertime I am thinking of seriously doing that. We will update our customers later on the date. Clean up my work area. I have heard said that the sign of a genius is a cluttered desk. (I can't seem to convince my wife on that one.) But then to think of it my desk isn't really cluttered I know right where everything is. Just ask me to get you something and I will be able to get it for you right away. Well most of the time. Well sometime. Cleaning out the storage sheds would be another item on my not to do list. Those 50 pound boxes of soy wax and candle jars can get heavy to move and besides that it gets pretty warm in those sheds this time of year. Why The Soy Candle Maker Can't Say Lazy Days Of Summer. Soy Candle Shoppes Always Stay Busy. Even though we are in those hazy, lazy, crazy days of summertime. We here, at Papa’s Candle Shoppe, makers of fine soy candles, are not so lazy, maybe just possibly a little crazy. We have lower some of our prices for the summer months, check out our Deal of the Day Specials and you will see why I say crazy. Now is the time to replenish your dwindling supplies of highly scented soy candles. Remember that our scented candles add beauty to any decor both the 8 oz Jelly jar and the 27 oz Double Wick Vibe Jar. These soy candles do a great job in freshening up a room and bring in some of those floral scents that usually get shut out of the home because of the stuffy closed feeling you get when running air condition units. Not so lazy I say because now is the time to build up our supplies for the upcoming busy months of the fall and Holidays. So we here at Papa’sCandle Shoppe are working and preparing so that we can be at the top of our game to bring you the best in scented soy candles. Remember if the label says Papa’s Candle Shoppe… then it is Excellence in Soy! 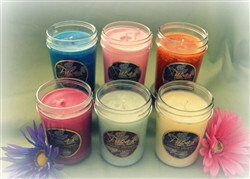 Soy Candles Quicker Delivery and Lower Prices During The Summer Months. Now Is The Time To Buy Scented Soy Candles. Even as the days are getting warmer and longer. (summertime) Sales for soy candles do have a tendency to cool some and be not as hot as they are in the fall and winter. Giving you an advantage when it comes to stocking up and getting candles for your home. Why purchase soy candles at this time of year? Since candle makers use this time to plan for new inventory and candle designs they too are aware of the slowness of the season. All there seasonal wholesale buyers have already stock up in the spring and wanting to keep funds flowing into the business they are more then ready to lower there prices and offer free fast shipping on there soy candles. This brings cash into the business and lowers the old inventory making ready for fresh inflow of candles. Take time to light a candle and freshen up the home and as you do, remember now is the time to buy and save.